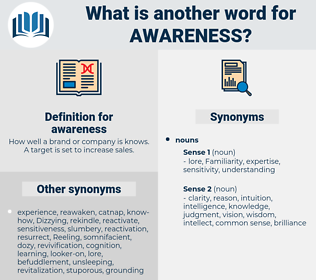 What is another word for awareness? How well a brand or company is knows. A target is set to increase sales. consciousness-raising, awareness-raising, consciousness, conscientiousness, sensibilisation, cognizance, cognisance, sensitisation. self-awareness, awarenessraising, sense, self-consciousness, public-awareness. matters, issues, data, media, GSS. Perceptions, sensitizers, minds, insights, participants, campaigns, swindlers, advocates, acquaintances, experiences, managers, concepts, thoughts, views, Friends, Abilities, claims. sensitizing, realization, data, visibility, sensibility, awakening, reputation, susceptibility, tenderness, abreast, ignorance, mind, mentality, sensitiveness, opinion, sensitizer, renown. learned, publicised, acknowledged, realized, Propagated, Promoted, advised, recognized, experienced, appreciated, presented, conveyed, Issued, heard, revealed, Introduced, saw, disclosed, reported, involved, Obtained, faced, announced, Launched, Fainted, unveiled, published, projected, received, Came, released, Dealt, Met, understanding. understanding, conscience, appreciation, advocacy, recognition. realisation, sensitization, understanding, vigilance, notoriety, conscience, cognition, appreciation, advocacy, recognition. Harry never could remember what he had done in those hectic seconds that immediately preceded his awareness of her existence; according to her own subsequent account he had slapped her violently several times on the back, put his arm around her, shaken her by the scruff of her neck and shouted inarticulate and impossible things in her ear. It is difficult to hold that 'my representations' here means objects of which I am aware, and that the thesis to be established is that I must be capable of being conscious of my own identity throughout all awareness or thought of objects. airing, araneus, arming, aramus, ARNG, arnica, arms, arenaceous, arrange, arminius, Aranyaka, air mass, arrhenius, airiness, aramaic, arenga.